How much are HOA dues for Ballard Seattle Condos? And what's included in Ballard condo HOA dues? The Ballard neighborhood Seattle has lots of different condo styles. From modern construction with the latest bells and whistles to funky older ones that Don Draper would feel right at home in, and from large units with expanisve views of the Puget Sound to small condos on busy roads. But one thing they all have in common is that they ALL pay monthly Home Owner Association (HOA) dues. Compared to buying a house, when buying a Ballard condo, or any condo for that matter, you need to do some additional research. Here's a post I previously wrote on The 9 Critical Questions to Ask When Buying a Condo. It's too late to ask after you've closed on the home! And one of those questions is: "How much are the HOA dues and what do they cover?" As you will see below, there's a lot of variation in what you might pay from one condo development to another. When looking at condos for sale in Ballard Seattle and calculating your potential monthly mortgage payments make sure to allow for HOA dues. Here are some numbers on HOA dues for Ballard Seattle condos. I looked at HOA dues for condos that were either currently for sale, pending or had sold over the past 2 months in the Ballard neighborhood as of the first week of October 2018. I looked at dues for both 1-bedroom and 2-bedroom condos. For each, I calculated the average monthly HOA dues and the range (low and high). All data were obtained from the NWMLS. There were 28 one-bedroom and 24 two-bedrooms units. 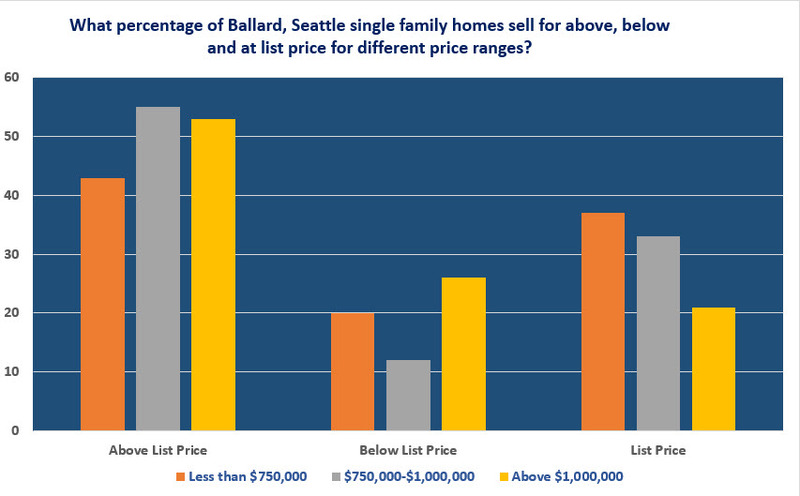 Percentage Of Ballard Seattle Real Estate Selling Over List Price? How competitive is Ballard Seattle real estate for single Family homes and condos? In the current strong sellers' real estate market in Seattle, home buyers are having to compete to buy a home. The housing inventory is, and has been for a few years, acutely low. Home buyers will probably feel like every home is getting multiple offers and selling for well above list price. Some buyers will give up trying to buy a home and feel like they will never get their foot in the home ownership door. Are all homes for sale in Ballard Seattle WA really selling for above list price with multiple offers? So, what is the reality of the current Ballard Seattle WA real estate market? I looked at sale statistics for Ballard single family homes (houses and townhomes) and condos that sold over the 3 month period up to the middle of January 2018. All data was pulled from the Northwest Multiple Listing Service (NWMLS). Data was combined for the area covering Ballard, Loyal Heights, Sunset Hill and Whittier Heights neighborhoods. Note that is the middle of winter when the market is usually "slower" than the spring and summer months. In this market, slower is a relative term. How Ballard Seattle home prices vary by sub-neighborhood. Homes for sale in Ballard Seattle are a popular option with many home buyers. Ballard is a great, self-contained neighborhood with lots to keep you occupied but also a quick hop to downtown Seattle. Home buyers often inquire as to how Ballard Seattle home prices vary in different parts of the neighborhood. The Ballard neighborhood Seattle, or let's say the "greater Ballard area" starts with Whittier Heights to the east and extends to the appropriately named Sunset Hill area to the west, with Loyal Heights in between. 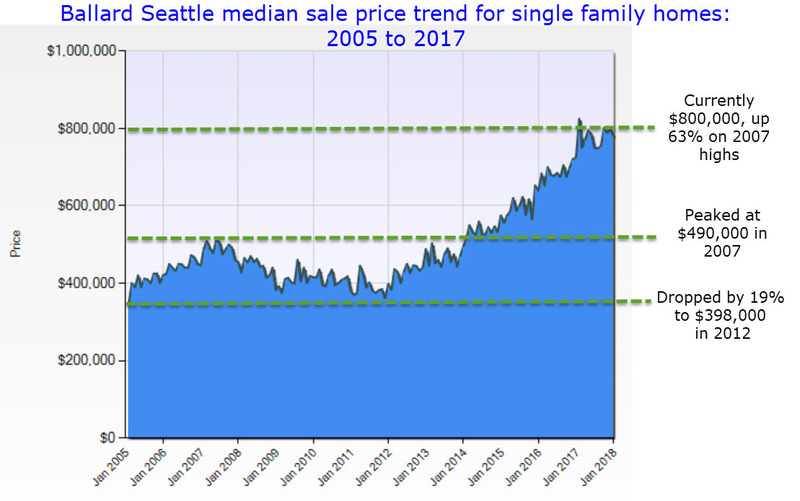 do Ballard Seattle homes prices increase as you move closer to the water? Between 8th and 15th Ave NW (includes Whittier Heights area). Between 15th and 24th Ave NW and NW 85th Street. Between 24th and 32nd Ave NW (includes Loyal Heights homes). West of 32nd Ave NW (Sunset Hill area). All section were bordered by NW 85th Street to the north and NW Market Street to the south. The 4 sections were chosen based on the main north-south arterial roads through the Ballard neighborhood Seattle. 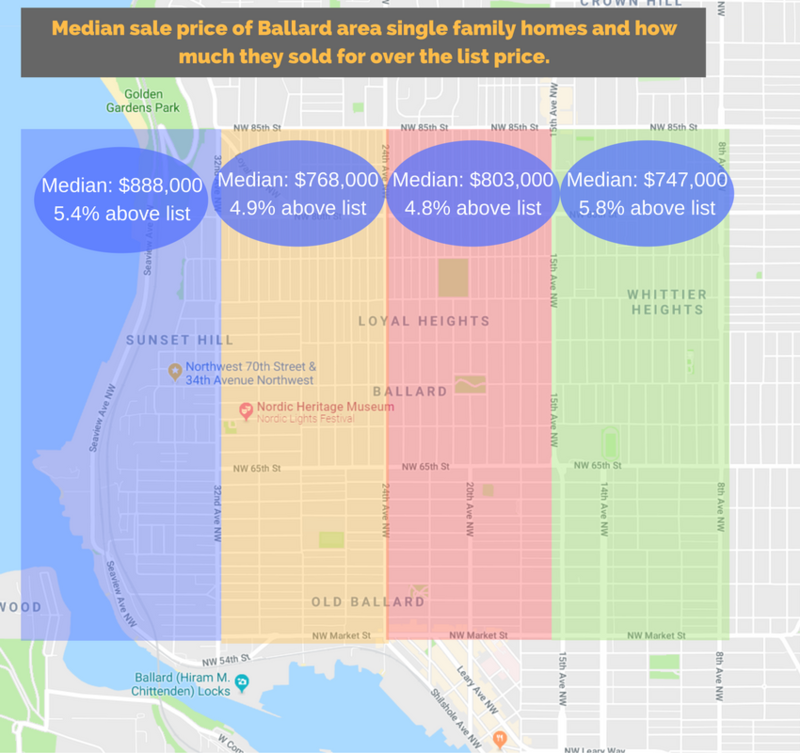 I looked at the sale of all Ballard single family homes (houses and townhomes). The data does not include condos. I looked at homes that sold over the 6 month period from July through December 2017. All data were extracted from the NWMLS.